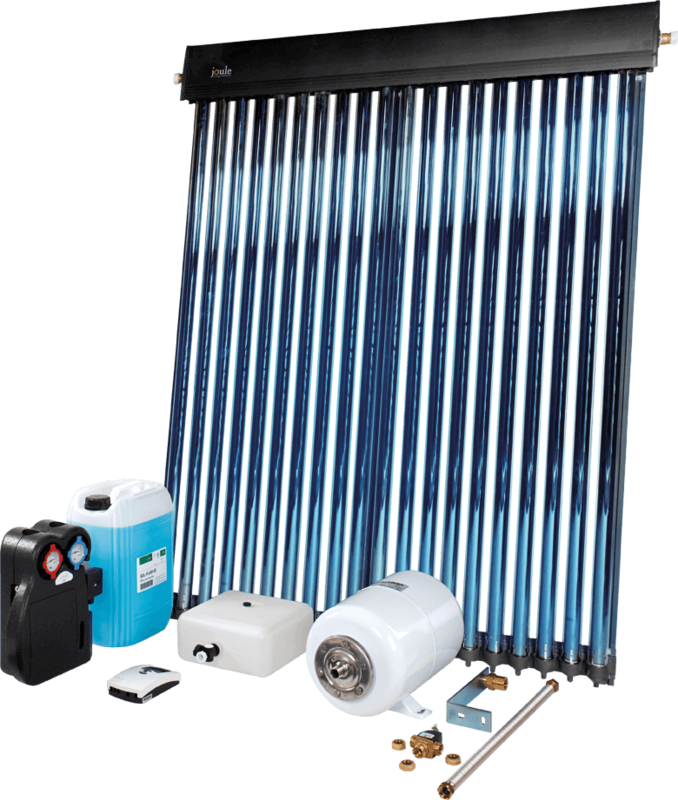 Joule stock a complete range of solar thermal systems such as solar electricity and solar photovoltaics. The solar thermal systems are suitable for every type of installation. From our high efficiency Acapella evacuated tube collector solar system to our Navitas 2.0m in-roof solar panel systems and on-roof solar panel systems. All solar systems supplied by Joule have been designed for Northern European climates that ensure a very high zero-loss collector efficiency figure of 85%. For every cylinder within the dwelling Joule have a solar panel that is compatible with it. The Joule Acapella Solar systems’ unique tube design ensures a very high zero-loss collector efficiency figure of 85% based on the absorber. The unique method used by Joule for fixing the evacuated tubes into the collector results in a significantly lower heat loss coefficient of 1.529w/m²K. The evacuated tube systems have an easy to install frame that ensures that the collectors are securely fixed and mounted onto the roof efficiently and correctly every time. The Joule Vissolis In-Roof solar systems have been tested up to four times the requirements of EN12975: 1-2. The high efficiency collectors are further tested to determine their maximum impact force resistance levels and the maximum positive and negative loading force that the collectors can resist. The sleek Joule Navitas On-Roof solar system is designed and manufactures to work in Northern European climates. The collector’s black finish makes it an attractive addition to any roof. Joule Navitas On-Roof solar systems have been tested up to four times the requirements of EN12975: 1-2. The high efficiency collectors are further tested to determine their maximum impact force resistance levels and the maximum positive and negative loading force that the collectors can resist. Joule solar controllers manage the efficient transfer of solar heat energy from the collectors to the water storage tank. With the solar controller you have got your solar system at your fingertips wherever you are. You can switch back and forth in-between different display charts and run your finger along a graph to monitor temperature developments to the minute.